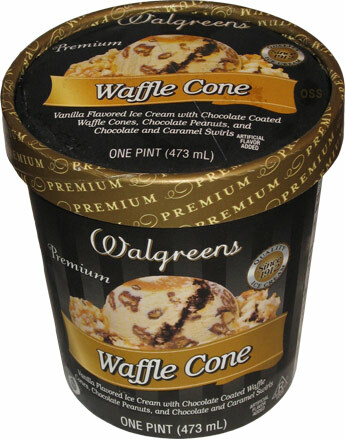 You know, if you put Waffle Cone in the name of your ice cream, you should be VERY sure it actually tastes like a waffle cone. You guessed it, I am disappointed with this ice cream. It's not that it's bad, it's just that it doesn't even come close to living up to it's name. chocolate peanuts, and chocolate and caramel swirls. The description really should be vanilla ice cream with hints of chocolate covered somethings and tiny streaks of chocolate and caramel. I really don't know what's up with this flavor. It's embarrassingly underwhelming. The base is fine, but you just keep digging for the goods and keep coming up empty. The waffle cone pieces must be really thin, because you can barely taste them when you do occasionally find one. I guess those itty bitty chocolate pieces I keep finding must have peanuts inside (not that you can taste them). And using the word "swirls" just seems wrong. It's these tiny little streaks that get totally lost in the scooping process. 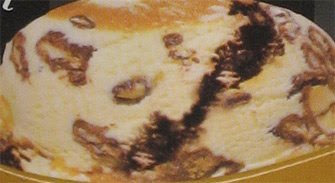 This is a closeup of the picture on the container. Maybe I got a container from the bottom of the batch, but this was truly disappointing. Again it's not that it's bad, just, well, it's a lie, the ice cream doesn't even come close to the picture. 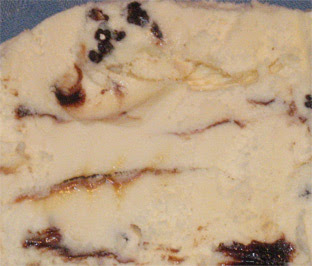 Have you tried Ben & Jerry's Americone Dream? I think it's great but I'm wondering if that Breyer's flavor would still be better. I loved Coney Island Waffle Cone. I think Americone Dream pales in comparison. The Dreamery website is current, 2009, but it doesn't say where you can get it. I'd love to have that back in the stores again. If you want great tasting waffle cone pieces in ice cream, try Haagen-Dazs Caramel Cone. It's a caramel based ice cream with chocolate covered pieces of waffle cone and ribbons of caramel. It's very sweet.